As are the missions themselves, many visitas are in danger of being lost to careless acts or apathy such as these ruins at San Juan de Dios destroyed by a farmer in 2008, 5 years after this photo was taken by Jack Swords (copyright). Visitas (also known as 'estancias') were visiting stations of the 'cabecera' or primary mission. They had a church, inhabitants, and operated the same as a mission, but without a resident priest. A mission was located at a source of water, often at an existing native Indian village ('rancheria') and had a limit on the population it could support. Visitas were located at other water sources and rancherias, where additional food could be raised to support the entire mission territory. The mission priest would visit these outposts and perform his duties, as needed. Long after the mission system ended, some locals (and authors) believed many visita ruins were missions. Some Baja books still name visitas as mission sites. 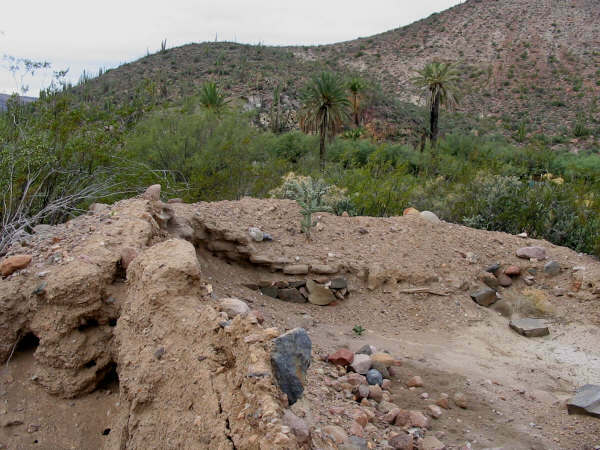 For a complete listing and details of the 27 missions of Baja California founded from 1697 to 1834, see the Baja mission web pages in the links, below.